On 26 October 2018, Andrea Saldarriaga and Andrea Shemberg, Visiting Fellows at the Laboratory for Advanced Research on the Global Economy, participated in the World Investment Forum (WIF). The WIF is the global platform for investment and development organised by the United Nations Conference on Trade and Development (UNCTAD) that brings together over 4,000 participants from 160 countries. While the work of UNCTAD has in the recent years placed a special interest in how investment can contribute to sustainable development, the topic of human rights as a fundamental component of sustainable development still struggles to find a place among the discussions at the WIF. In a week-long Forum, only two sessions explicitly looked at human rights. Shemberg and Saldarriaga presented in both sessions. Andrea Shemberg spoke at a side-event organised by the Office of the UN High Commissioner on Human Rights (OHCHR) and the Heinrich Böll Stiftung Foundation about the push to build mega-infrastructure projects worldwide to meet the Sustainable Development Goals (SDGs) and the human rights risks of such projects. The discussion focused on the role of international investment agreements, national laws and State-investor contracts might play in ensuring that the State right to regulate is respected in the context of such projects. Shemberg spoke about the danger of simply pushing for mega-infrastructure in the name of meeting the SDGs, without regard to the quality of the investment and the design of the infrastructure, which must place a priority on avoiding and mitigating the negative impacts of such projects on the rights of people. She argued that the rhetoric around meeting the SDGs, which focuses on the dollar amount of infrastructure investment needed, risks blinding institutions, investors and States to the need to ensure that infrastructure projects are pursued in a manner that respects human rights. Shemberg also spoke about the importance of using the UN Principles for Responsible Contracts, not as a guide to drafting contracts, but as an agenda-setter for negotiations – ensuring that human rights issues are discussed among the parties to an infrastructure investment at the project’s earliest stages. The OHCHR report on mega-infrastructure is available here. 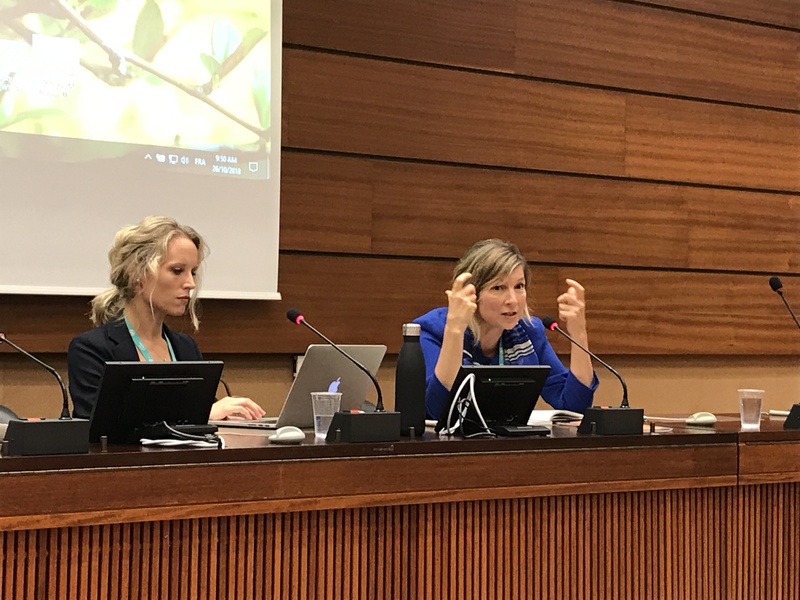 Saldarriaga and Shemberg presented in the roundtable “Creating More and Better Jobs through Investment” co-organised by the International Labour Organization (ILO), the OHCHR and the World Association of Investment Promotion Agencies (WAIPA). During the roundtable, the audience heard from investment promotion experts about their strategies to boost foreign direct investment with a focus on creating more and better jobs. 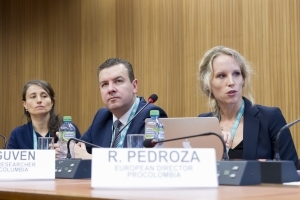 Saldarriaga broadened the discussion to reflect on how the role of IPAs of promoting and facilitating investment relate to human rights and how the UN Guiding Principles on Business and Human Rights apply to the work of IPAs. She focused on two key aspects of the UNGPs as relevant for IPAs. First, she discussed the role of IPAs as setting and managing the expectations of inward and outward investors on their responsibility to respect human rights. Second, Saldarriaga focused on the role of IPAs in clarifying and supporting investors in managing human rights risks. Finally, Shemberg offered her reflections on the role of IPAs as instruments of public policy and as key for ensuring investment is carried out while respecting human rights. She focused her comments on the need to build understanding about the potential for trade and investment policy to hinder the IPAs’ ability to regulate on human rights issues and pushed the IPAs in the room to think about how they are measuring what are ‘better jobs’ in terms of defining criteria reflecting ILO standards and collecting disaggregated data to understand whether gains in employment are being shared equally across society.